Occupation has been traced back to about 2000BC but the first evidence of a permanent settlement was in Saxon times when the village was called Stede. The Roman road, Stane Street passes through the south east of Ashtead where there is a site of roman occupation near St. Giles Church. There is also the remains of a Roman villa on Ashtead Common and traces have been found of a major tile works which may have supplied a major market in the South East and was probably the main economy of the villa. Little is known of the 600 years from the departure of the Romans to the Norman Conquest. It is likely that there was only a small hamlet of 40-50 people living here in Saxon times. Human bones, thought to be Saxon were found in Ermyn Way and the grounds of what as the time, Goblin's works. After the death of King Harold at the Battle of Hastings, ownership of Ashtead passed to William the Conqueror's half brother, Odo, Bishop of Bayeaux. Tile making went on in the 14th century and by the Tudor period the population had grown to about 200 people, although this was reduced by about a third by the Black Death. The principal occupation of the area was farming which peaked in the 1850-1860s when there was 5 farms. However the decline started by 1870 with the import of cheap American grain and by the hard winter of 1880/1. The farms switched to livestock but this too was hit by cheap frozen meat from South America. 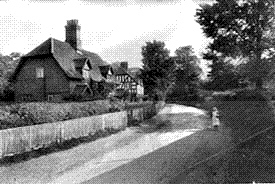 When Mary Howard, whose family owned most of Ashtead at that time sold her property in 1879, developers moved in due to Ashtead's closeness to London. St Giles Church was built in 1120 as a chapel and became a church in the 13th century. It stayed much the same until 1839 when it was restored and extended. St Georges Church replaced an Iron Church that was donated in 1882 and was completed in 1906. However further work to extend and enhance the church was undertaken between 1959 and 1964. Further improvements have been made since 1995, in particular a new church hall. The Ashtead Free Church started as the Ashtead Gospel Church in 1895 in another iron church. This was replaced by the current building in 1924. St Michael's Catholic Church started in a large garage of a private house, Mawmead Shaw which had been purchased in 1944. It was pulled down and the current building opened in 1967. The private house, Rushmere behind was also purchased and demolished to make the church hall. In the 18th century, Ashtead had 3 pubs all owned by Richard Howard. The Berkshire Arms which disappeared in the 1820's, The Haunch of Venison that transferred its licence to the Leg of Mutton and Cauliflower was on the site of what is now Forest Lodge. The “Leg”, as it is known locally was also a farm until the late 19th century. There is evidence of an earlier pub on that site, The Three Horseshoes between 1655-84. The current building dates back to 1890 but part of the original pub still exists in the rear. In 1839 there was a beer shop on the site of what is now The Brewery which started brewing its on beer in 1871. At about the same time, The Woodman had a rival beer shop which was very popular with the navvies who built the railway. The current building was built in the 1930s. By 1836 there were 12 stagecoaches travelling through Ashtead but this declined with the arrival of the railway in Ashtead in 1859 which was electrified in 1925. The Victorian age saw a resurgence of road use with the arrival of the bicycle and the motorcar. By 1913 there were regular motorbuses coming to Ashtead with day visitors who visited the common and the roman villa excavation. There were teahouses on both sides of the railway, a helter skelter and a further teahouse in Rectory Lane. 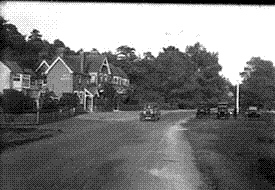 By 1925 traffic through Ashtead had increased to such an extent that a complaint was made to Surrey County Council about the noise. In 1924 the much needed Peace Memorial Hall was built with funds raised from events held in the 1920's. in 1932 the recreation ground in Lower Ashtead was opened. In 1901 Ashtead had its own independent Fire Service but this was merged with Leatherhead in 1926. In the 1880's pumped water arrived supplied by East Surrey Water from its pumping station in Leatherhead. Gas was supplied at about the same time but electricity did not arrive till after 1900. Drainage and sewerage removal also was improved by 1900. Development stepped up a gear with the arrival of the railway and most of the farm land made way for houses for commuters who worked in London. If it hadn't have been for the Green Belt that was created in 1947, all the woodland that we enjoy today would have disappeared and Ashtead would have become another suburb of London. In the early 20th century, Ashtead had a brickworks, a photographic plate and paper production, leather manufacturing and a pottery even silk making but all have disappeared over the years. In more recent times there was a factory that produced leathercloth for the motor industry located in The Street, originally owned by Brifex and later by Carrington Vyella but that closed in the mid 70's. Goblins were based in Ermyn Way for many years producing electrical goods, including the teasmade but they closed and the site is now owned by Esso. Remploy who employed disabled people to make leather goods have also gone. Prior to them, Thermega used to make electric blankets in that building. In recent times, the building of the M25 has increased the popularity of Ashtead as a place to live and there has been much "in filling" to maximise the number of houses. There may be some relaxing of the green belt restrictions to provide affordable housing which is in chronic short supply.